← Best Underrated $5 or Less Deals from the Steam Summer Sale: 2016 Edition! Independence Day means a trip to the local pop-up fireworks stand for my family. While there this year, my video game-addled brain was gleefully struck by the extent of the copyright infringement I saw from my favorite hobby. Here are some pics of what I was able to catch. Fair warning up front, these photos aren’t great. The camera on my phone isn’t so good at taking indoor shots. I almost didn’t post these because of the poor quality, but I ultimately decided what the heck. Poor Samus. The Metroid series has been missing in action for quite a while, and now that a new release has finally been announced, it doesn’t even star our favorite mute galactic bounty hunter! With her career prospects in the gaming industry looking glum, I guess she had no option but to spokesmodel for this cheap imported fireworks brand. This one is utterly baffling to me. The character in the center is completely unknown to me, and I assume he’s an original design by the manufacturer. But in the background……..the clouds are immediately recognizable to any longtime Nintendo fan. What’s impressive is that they are very close replicas of the clouds from the original Super Mario Bros., except completely de-pixelated. I’m bizarrely fascinated by the how and why of this. Did they have an artist trace over the old 8-bit art? Or maybe they just applied a filter in Photoshop to eliminate the pixelation? And why go through this trouble of copying the clouds from SMB? It’s not like clouds are hard to draw. Other than the clouds, the big cylindrical hills are clearly imitated from the New Super Mario Bros. games. You know, I could understand ripping off a popular character like Mario for your packaging. He’s recognizable and eye-catching. But why copy something so obscure like parts of the environment that only a handful of obsessed nerds like myself would spot? Here’s one which I initially passed over, but then was struck by a lightning bolt when I realized what I had seen. 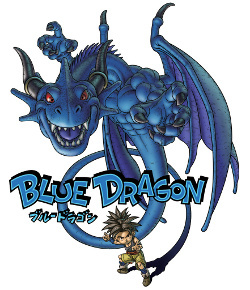 The logo is straight taken from the old Xbox 360 RPG, Blue Dragon. The only difference is that it’s been tilted just a little bit. What’s interesting is that the artwork of the blue dragon behind the logo doesn’t come from the game’s art. I tried to do a Google image search to find its source, but nothing came up. I can only assume it was lifted from some poor Deviant Art page out there. This is another odd Mario one. This particular fountain was called “Pure Fantasy” and had several fantastical characters drawn on the packaging. The weird thing was that most of the characters on the box seemed to be generic animals and fantasy creatures. Nothing looked to come from a trademarked property except for this very conspicuous Mario knock-off. In general, I would have expected to see a lot more infringing material from things like cartoons or movies, but for some reason, I only found stuff lifted from video games. I guess for the people whose life’s work is making pretty explosion, they find some sort of kinship with the gaming industry. This one was a bit of a dud. I snapped it thinking that it was a loading screen from Duke Nukem. But after doing some Google image searches, it does bear some similarities, but it’s not a direct screenshot. And considering the Duke Nukem logo is just a radiation symbol which is commonly associated with big (nuclear) explosions, the similarity may just be coincidental. The loading screen from Duke 3D. There was also another box that caught my eye that was simply called “FPS”. This one was in direct eye line of the cashier, and I didn’t want her to see me snapping pics, so I don’t have any photos of that one. It had what looked to be a screenshot of an old FPS covering the box, but I couldn’t quite place the game, so it may have been a completely original image made by the fireworks company. But again, it just reinforces my notion that the fireworks industry has a fixation with gaming. Posted on July 9, 2016, in Essays and tagged Gaming, Nintendo, Video Games. Bookmark the permalink. 1 Comment. Yeah, I doubt Nintendo endorse these products haha.